Earlier last year, my mother started talking to me about some fabulous new ingredient her friend had introduced her to. Out came a bucket filled to the brim with red lentils. I immediately pointed out their name but she didn't seem to think I was right. She kept calling them something else which I can't recall anymore. Anyhow, she was apparently using them to make a sweet rice dish that is common in Vietnamese cuisine. I suppose when you cook red lentils, they turn into a mush similar to sweet mung bean paste so it made a bit of sense. I, on the other hand, wanted to turn these reddish-orange dots into a savory dish so with the help of some homegrown kale, they became dal...with kale! 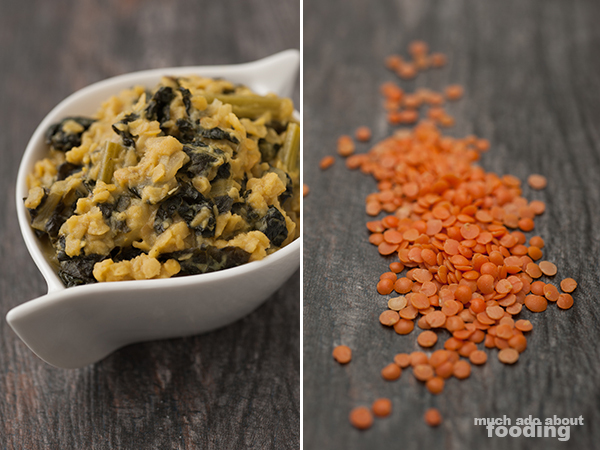 Dal is quite the heavy side dish to have (or is it an entree...?) so a little goes a long way. In a large pot, melt butter and olive oil together. Then add in coriander, fennel, and turmeric, stirring frequently to avoid burning. Once aromatic, add to the mixture your diced onion until it is nearly translucent. Add in garlic, jalapeno, ginger, and lentils. Cook for 2 minutes. Then add coconut cream and chicken broth. Bring to a boil; then simmer for 10 minutes. The goal is to get the lentils to soften up before adding the hardy kale. 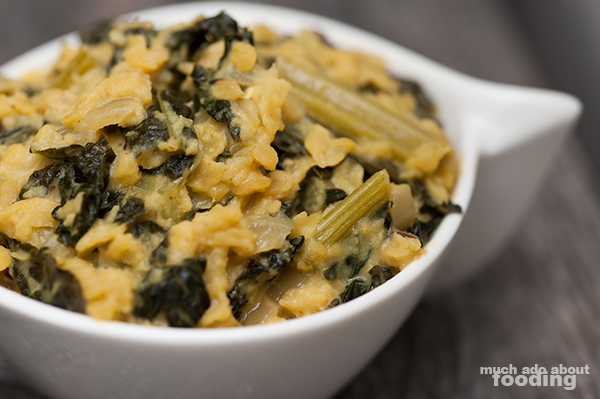 Once the lentils are semi-soft, add in chopped kale and submerge in the broth. 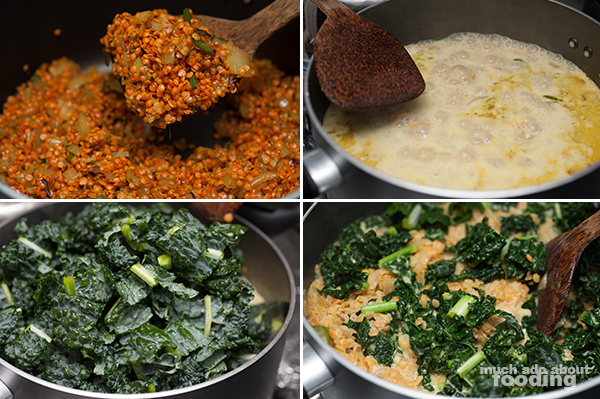 Cook for 20-25 minutes until both the lentils and kale are softened. Enjoy!